The Barbie 60th Anniversary Career Doll collection. Photo credit: Mattel Southeast Asia. How is it that someone can stay as fab and famous at 60 as she was already at birth? Well, Barbie can. The world’s most ubiquitous toy doll celebrates her diamond jubilee this year and no other doll has come close to dethroning her as a global icon of aspiration, culture and fashion. 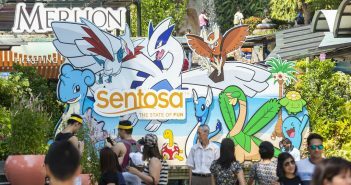 Over 150 countries worldwide have come together to mark her six decades of heritage, and Singapore is no exception. 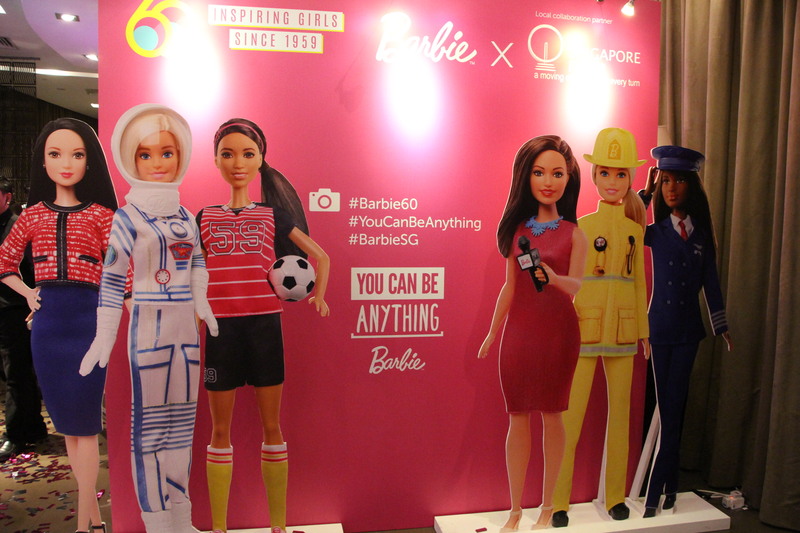 #Barbie60 celebrations held at the Singapore Flyer on 8 March. The #Barbie60 campaign this year resounds with the theme “You Can Be Anything”- a message to empower girls that they can be anything they imagine to be. Back in 1959, Barbie was created to give girls a role model to imagine their future selves. Today, she has evolved from her previously unrealistic proportions described as anatomically impossible (really tiny waist) to a diverse and inclusive doll line of over 100 new looks, with a myriad of skin tones, hair colours and textures, eye colours, facial structures and body diversity. Whatever type of person you are, you can definitely find a Barbie to identify with. 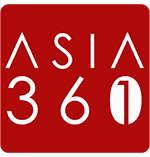 “Barbie’s 60th celebration is a step towards helping girls to know of a world where they can achieve any job or dream and take bold steps into careers where women are less represented,” said Ms Chris Chan, Head of Marketing, Mattel Southeast Asia, as she kicked off the Barbie 60th anniversary celebrations in Singapore held in conjunction with International Women’s Day. 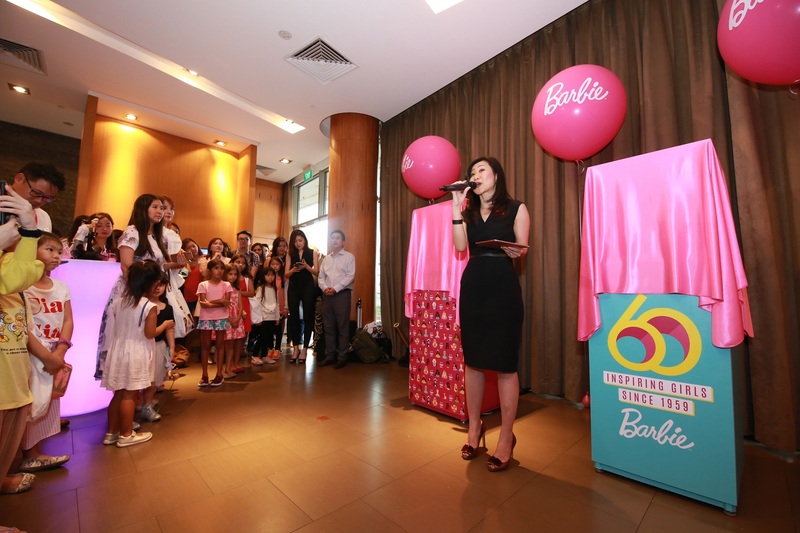 Chris Chan, Mattel Southeast Asia’s Head of Marketing at the #Barbie60 celebrations in Singapore. Photo credit: Mattel Southeast Asia. Given that one of Barbie’s missions is to inspire the limitless potential in every girl, a selected group of seven inspiring role models ranging in age from five-year-olds to women professionals were invited to share about their dreams and careers at the event. From young aspiring artists to bodybuilder and scientist, they serve as a reminder to all that you are empowered with choices and #YouCanBeAnything! 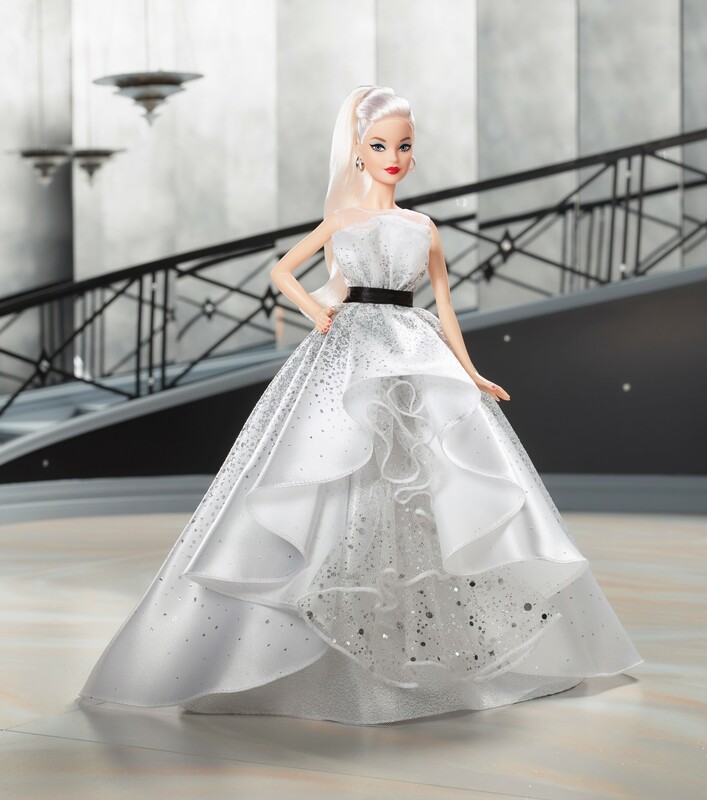 The celebrations also involved the launch of a new Barbie 60th anniversary career doll collection which comprises six careers–an astronaut, soccer player, firefighter, news anchor, pilot and political candidate, adding to over 200 Barbie careers (and counting!). They were chosen for roles underrepresented by women. Each doll features different eye colours, hairstyles, skin tones and body types and is available exclusively at Toys ‘R’ Us toy stores (S$24.99 each). For the collectors, the collectible Barbie 60th anniversary doll is such a darling. Wearing a cascading ball gown twinkling with silvery sparkles, she wears a dramatic ponytail hoop earrings and wrist tag, casting an irresistible side-eye glance at you. She will only be available (S$89.90 each) at the Singapore Flyer Gifts store (now available) and Toys ‘R’ Us, Takashimaya, and Kaboom at Changi airport (from June 2019 onwards). Another Barbie Travel Range collection will soon be launched in June. Barbie 60th Anniversary Doll. She sparkles! Photo credit: Mattel Southeast Asia. In line with the launch of Barbie’s Travel Range, iconic landmarks across five countries in Southeast Asia were lit up in her iconic pink. These landmarks, including the Singapore Flyer (Asia’s largest observation wheel), represent unique travel destinations where visitors are encouraged to embark on a journey of adventure and discovery. 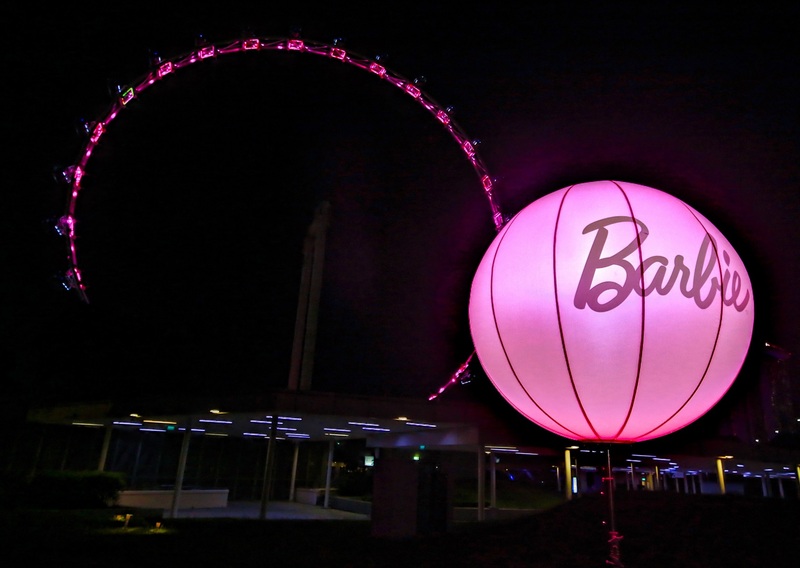 The Singapore Flyer lights up in Barbie pink during the launch of #Barbie60, until 21 March 2019. Photo credit: Mattel Southeast Asia. In Singapore, Barbie has partnered the Singapore Flyer to transform one of its capsules into a special flight for Barbie’s 60th anniversary. 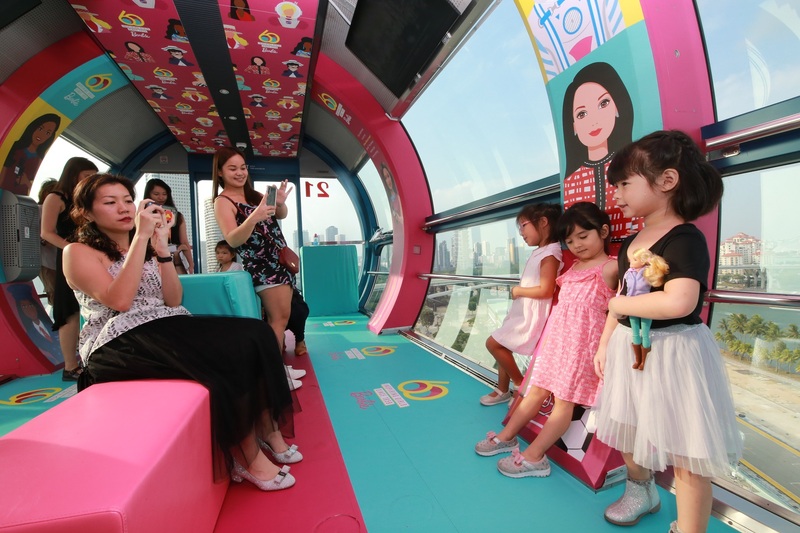 Until 30 June 2019, locals and tourists can board the exclusively-decorated Barbie Flight while admiring Singapore’s stunning cityscape. Spending S$20 on any Barbie products will enable you to enjoy a special S$60 adult and child bundle deal (U.P. S$100) for your Barbie Flight, valid until 30 June 2019 at stores islandwide. Barbie Flight on the Singapore Flyer. Photo credit: Mattel Southeast Asia. Spend S$30 on any Barbie® products and receive an online redemption Photobook voucher worth S$33.90 for free. Spend S$60 on any Barbie products and receive a limited edition Barbie 60th anniversary Tote Bag for free. These deals are valid at Toys ‘R’ Us, OG, BHG, Takashimaya at varying periods (check in-store for details). When not checking out new hotels or restaurants, Singapore-based writer Fen spends her time reading obsessively about and travelling to destinations with unpronounceable names. She also can't stop getting sentimental about vanishing trades and documenting them for posterity.